China's GDP growth was better-than-expected in 1Q, matching the growth of the previous quarter. How is this possible amid so much trade uncertainty? We have the answer. China's GDP growth stood at 6.4% year-on-year in 1Q, the same as in 4Q. This was a surprise to the market as the consensus forecast was 6.2% YoY, the same as ours. The official statement claims that consumption was the main economic engine, contributing more than 65% of the growth, which is just as expected. However, the contribution to GDP has fallen from 79% in 4Q. Retail sales grew faster in 1Q, at 8.7% YoY. And while that's up from 8.2% in 4Q, it is lower than our forecast of 8.9%. 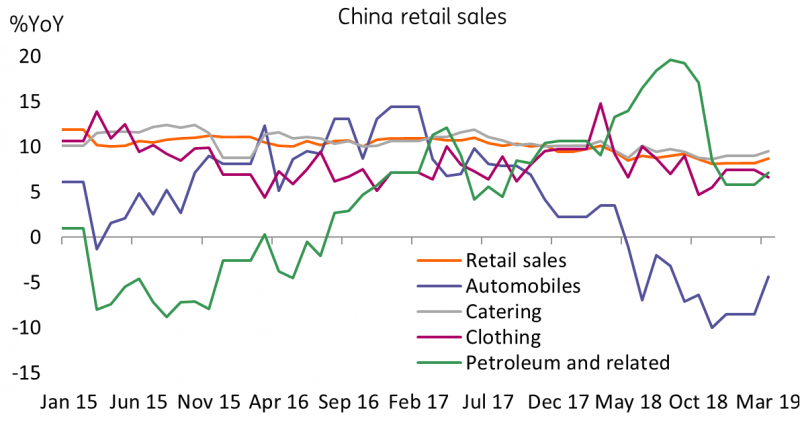 We usually use clothing sales as a proxy of the willingness to spend in China because this is one area that consumers can cut back on, in addition to big ticket items like cars, when confidence in the economy starts to slip. Clothing sales growth dropped to 6.6% from 7.4%. Investment growth was 6.3% YoY year-to-date, better than 6.1% in February. Most of this was infrastructure related, including items related to metro line construction (aided by fiscal stimulus) and 5G telecommunication. 5G's infrastructure investment and service investments were reflected in high-tech production line investment growth and high-tech service investment growth, at 11.4% and 19.3%, respectively, faster than overall investment growth. 5G is something we have underestimated. We focused too much on the impact that fiscal stimulus would have on investments and while we understood that 5G is a growth engine, we didn't realise that it is already in the ground, up and running. This is a unique growth engine for China. Industrial production jumped to 8.5% YoY in March from 5.7% YoY in February. The jump was exceptional, driven by both infrastructure projects and 5G production. On infrastructure projects from fiscal stimulus, the production of cement grew 22.2% YoY in March, a lot faster than 0.5% a month ago. Transportation equipment grew 13.6% in March compared to 10.9% YoY in 1Q19. On telecommunication production, growth was 10.2% YoY in March, a jump from 7.8% growth in 1Q19. 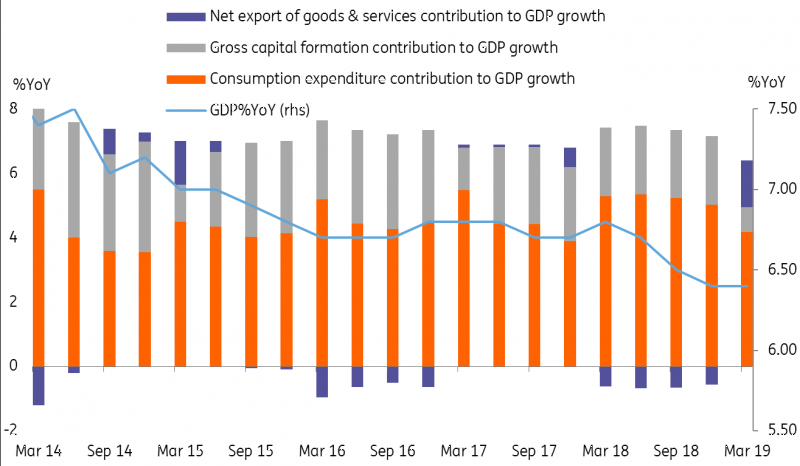 The impact of fiscal stimulus on infrastructure projects and 5G infrastructure production is the real growth engine that's supported GDP growth in 1Q. And we think the trend could continue for the rest of the year. The production of 5G infrastructure, and the downstream of 5G equipment, should support both investment and industrial production. Retail sales and consumption could still grow but perhaps only modestly, as ongoing uncertainty about a trade deal with the US caps investment from export firms and their supply chains and limits wage growth. 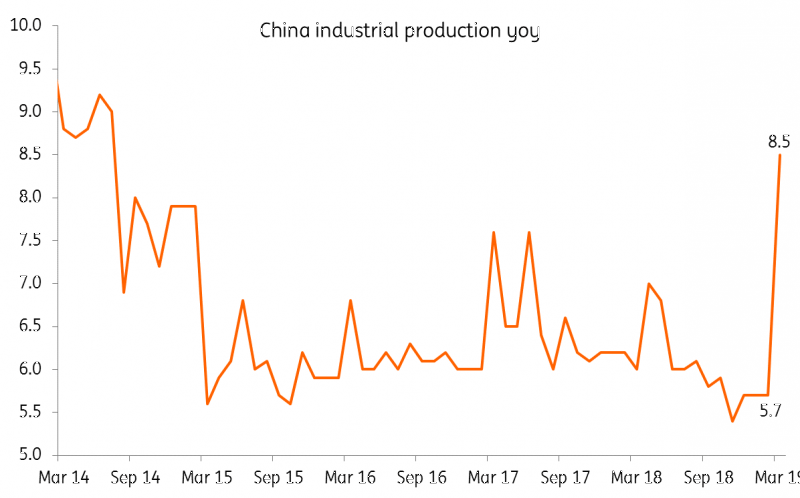 From the positive production data, it is likely that industrial profits- which will be revealed near the end of April- will increase in March. And with China's economic growth remaining strong, we expect the government will have a stronger hand to play in trade negotiations. Overall, we revise our GDP growth forecast in 2019 from 6.3% to 6.5%, which is the upper bound of the government target. On a quarterly basis, the revised growth rates are 6.4%, 6.5% and 6.6% for 2Q, 3Q and 4Q, respectively. After the strong GDP report, further RRR cuts appear to be more distant...the central bank will use open market operations more frequently as it is a flexible tool to control liquidity. We also don't rule out the central bank possibly absorbing liquidity from the market in a gradual way if it sees credit growth as too fast. Fiscal stimulus and telecommunication infrastructure have supported the economy. And as such, the job market should remain stable overall. This has been the government's primary concern and having achieved this, it can now shift its focus to other areas such as financial stability. The central bank recently noted that the economy doesn't need a flood of liquidity after credit grew 40% YoY in 1Q19. Coupled with the strong GDP report, the central bank today replaced an expired CNY366.5 billion 1-year liquidity with a CNY200.0 billion 1-year liquidity at 3.3% and a CNY160.0 billion 7-day liquidity at 2.55%. This means that the central bank has shifted some of the 1-year liquidity to 7D liquidity, and reflects the fact that the bank would like to be more flexible in liquidity management. By doing so, it achieves the result of pushing the interest rate downward, which would also be the case if there were a cut in the Reserve Requirement Ratio. We previously forecast four RRR cuts in 2019. The first cut was implemented in January, and we expected three more at the beginning of each quarter. But after today's strong GDP report, further cuts appear to be more distant. The RRR is one of the most rigid liquidity management tools because once it is reduced, the liquidity injection is long-lasting, and the central bank can only absorb liquidity through open market operations or raise the RRR to unwind the impact. Our view is that the central bank will use open market operations more frequently as this is a flexible tool to control liquidity. We also don't rule out the central bank possibly absorbing liquidity from the market in a gradual way if it sees credit growth as too fast, although this may only happen if 2Q GPD maintains its current growth pace. The yuan has been fairly stable against the dollar in 1Q, depreciating only 0.18%. It has fluctuated in a narrow range of around 1.8%, following the ups and downs of the dollar index but not to the same extent. This narrow trading range could remain in place even after a trade deal has been reached. If there is disagreement on a possible deal, the central bank could demonstrate China's political independence by depreciating the yuan slightly. In 2019, we think the USD/CNY will track the dollar index. Our forecast for the USD/CNY of 6.75 by the end of the year essentially tracks the development of trade talks. But we need to closely monitor the yuan's moves post-trade talks to determine if we need to revise up our yuan forecast in 2Q and 3Q. As of now, the quarterly forecasts on USD/CNY and USD/CNH are 6.85 for 2Q19 and 3Q19. Read the original article: China GDP too good to be true?